RILEY Ellis claimed his third tournament win of the season to blow open the title race on the Cuestars Under-21 Silver Tour. 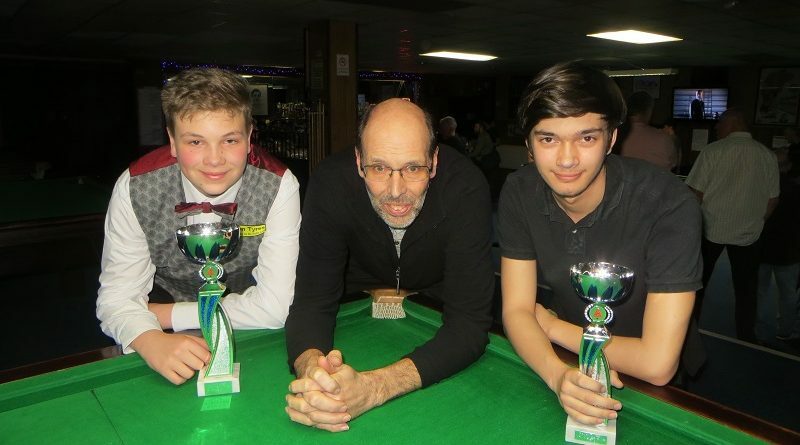 The 14-year-old from near Royal Wootton Bassett defeated Swindon’s Shane Kearns 2-1 in the final of the eighth leg at Top Spot Snooker Club, Havant. It means only 11 points separate the two Wiltshire teenagers and two Essex lads with two legs remaining. Ellis, who had lost 2-1 to Kearns in the round-robin group stages, “found a little bit more” in the deciding frame of the final. “I didn’t play enough good safety in the second frame,” he admitted. Earlier, Ellis scraped through his group as one of the two best thirds and overcame Portsmouth potter Samuel Laxton 2-0 in the last-eight. And he reckoned Nat Kidner (Bournemouth) “played really well” in his 2-1 semi-final success. Ellis is now just two points shy of rankings leader Louie Leighton (Basildon), who was knocked out 2-0 by Kearns in the semis. Kearns is eight points further back in third – one ahead of Richard Hillgrove (Southend), who went down 2-1 to practice partner Leighton in the last-eight. The awesome foursome cross cues again in the ninth leg at Salisbury Snooker Club on April 7 and then finish the season on Ellis’s home tables at Chandlers Ford Snooker Club on May 5. Renowned table fitter Trevor Sanders, who underwent a liver transplant last November, sponsored the event and presented the trophies. The previous day, Ellis, who won the second leg in Waterlooville and the fourth in London, reached the quarter-finals on the EASB Regional Junior Tour at Racks Snooker & Pool Bar, Maidenhead. ROUND-ROBIN GROUP A: 1st, Louie Leighton (Basildon SC); 2nd, Will Forster (Mayfair, Gosport); 3rd, Dean Russell (Waterlooville Sports Bar); 4th, Callum White (Waterlooville Sports Bar). ROUND-ROBIN GROUP B: 1st, Samuel Laxton (Waterlooville Sports Bar); 2nd, O’Shay Scott (Chandlers Ford SC); 3rd, Richard Hillgrove (Basildon SC); 4th, Oliver Cooper (Frames, Coulsdon); 5th, Keegan Reed (Salisbury SC). ROUND-ROBIN GROUP C: 1st, Nat Kidner (Greenbaize, Bournemouth); 2nd, Shane Kearns (Jesters, Swindon); 3rd, Riley Ellis (Chandlers Ford SC); 4th, Kaine Petty (Salisbury SC); 5th, Mason Wilson (Academy, Basingstoke). QUARTER-FINALS (12 points): Leighton 2-1 Hillgrove, Kearns 2-1 Scott, Ellis 2-0 Laxton, Kidner 2-0 Forster. SEMI-FINALS (15 points): Kearns 2-0 Leighton, Ellis 2-1 Kidner. FINAL (25/18 points): Ellis 2-1 Kearns. From left: Riley Ellis, sponsor Trevor Sanders, Shane Kearns.